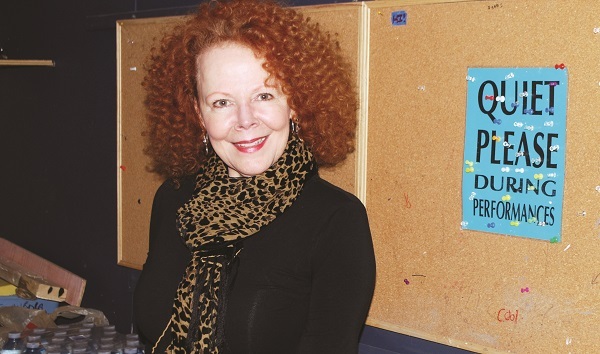 Actresses of a certain age begin to recognize there are only going to be certain types of roles that are going to come your way, says community theatre veteran Joanna Megraw. The self-described “theatre gypsy”, and Bradford resident, says she is aging out of what she describes as the “more prominent roles” that have punctuated her career in musical theatre over the past 25 years, but landing the lead role in Theatre Aurora’s upcoming production of Kimberly Akimbo, she truly found a role she could sink her teeth into. Kimberly Akimbo, a dark comedy by David Lindsay Abaire, follows the story of a teenage girl with a rare condition which causes her body to rapidly age, opens at Theatre Aurora next Thursday, February 5, running through February 14. Although Ms. Megraw finds those prominent roles more elusive as she matures, counting the “Mames and Hello Dollys” on her to-do list, she says she is enjoying this change of pace and the opportunity to dig a little deeper and “be more emotional and vulnerable on stage” than one has the opportunity to be in a musical. “I just really got into that place of many years ago, feeling passionate at that age about something,” she says. As a teen, her passion lay in the theatre. At South Simcoe, her first significant role outside of the chorus was playing the Wicked Witch of the West to her mother’s Scarecrow. As she grew up, she said she felt she didn’t have the patience for the “hand-to-mouth” lifestyle of theatre, and went to University, now working in the healthcare field. But, she came to realise she could still maintain her passions while pursuing her career. In fact, her career experiences have helped her get under the skin of the characters she has played, particularly Kimberly. As she looks forward to opening night next week, Joanna says she is looking forward to seeing how the audience takes in the entire experience, and the passion each member of the cast and crew brings to the production.